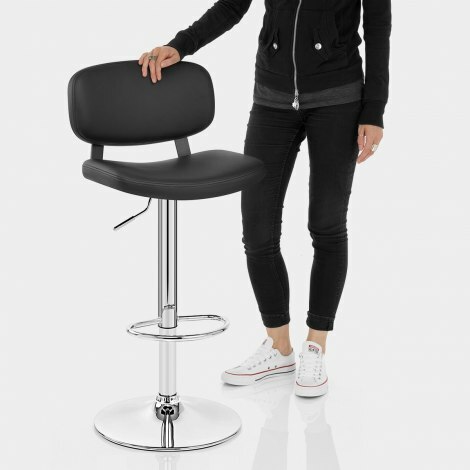 Upgrade your bar area with the Edge Bar Stool Black, a classically cool design with a chic retro appeal. 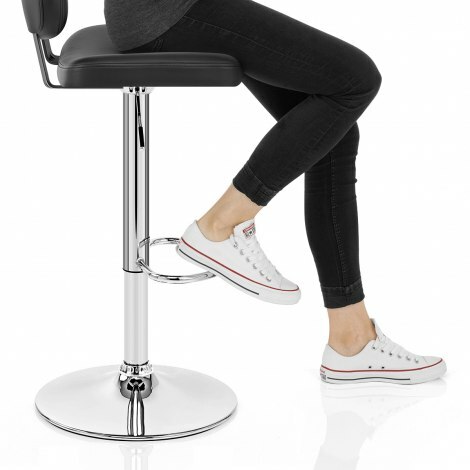 Offering a supportive seat with sleek modern style, the Edge Bar Stool has plenty of desirable qualities that will give your interior a touch of class. Bold in black, the sumptuous faux leather seat is comfortably cushioned, with a modest backrest that’s stylishly suspended for a fiendishly fashionable feature. Catching the light, the sleek mirrored chrome frame is a modern addition, with a handcrafted half-moon footrest making a convenient support for your feet. Famously user friendly, a state-of-the-art gas lift mechanism delivers variable height, whilst a user-friendly 360 degree swivel enables premium accessibility. With a protective base on the underside to help reduce the chance of damage to flooring, the Edge would make a remarkable addition to any home. The stools arrived on the day requested. Very easy to assemble and they look great in my kitchen. Very good quality and value for money. Fantastic next day delivery and after service was excellent. Edge stools have the edge! Love these! Got 3 in grey for myself and loved them so much got 2 more in black for my parents. They are so comfy, and a great size, just right. Kids love them too! Suggestion though is that it would be great if there were other colour options. All cream version is too light to use with young children. A tan, brown/cream mix, or even more colourful options like dark red or dark green would be super!